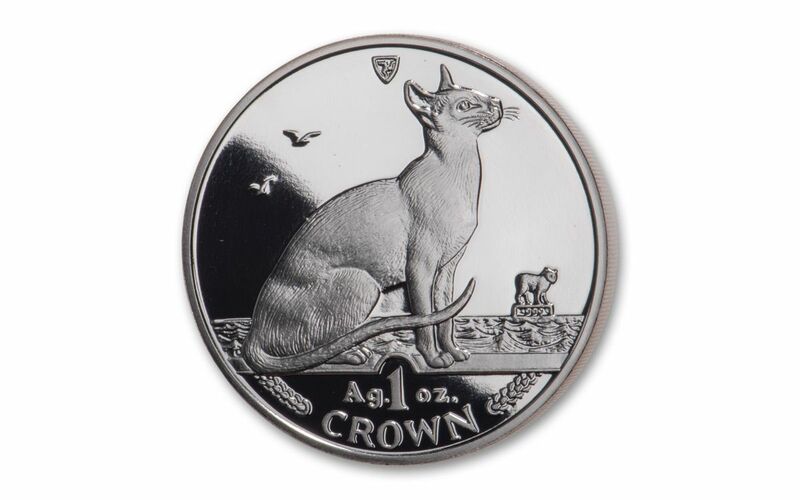 Now you can add the key-date fifth year coin in the series to your collection with this 1992 Isle of Man Siamese Cat Silver Proof. Struck in a Troy ounce of highly-pure 99.9% silver, this legal-tender coin bears a denomination of 1 Crown and celebrates the oriental beauty of the Siamese Cat. Expertly crafted by the artisans at the Pobjoy Mint, the coin’s proof finish is the result of hand-selected planchets, polished dies and multiple strikes to produce beautifully frosted details rising over mirror-like fields. Instantly recognizable for its blue, almond-shaped eyes and triangular-shaped head, the Siamese Cat first made its way west more than a century ago as a gift to the English consulate general in Bangkok from the King of Siam (now Thailand). With its slender, elongated and muscular body, the Siamese Cat possesses a regal disposition. Siamese Cats are one of the oldest breeds of domesticated cats in the world and are noted as being highly inquisitive creatures that save all their affection for just one human companion. According to legend, these felines were temple cats that perched on tall columns around the throne and would jump onto people and scratch their faces if they threatened the king. 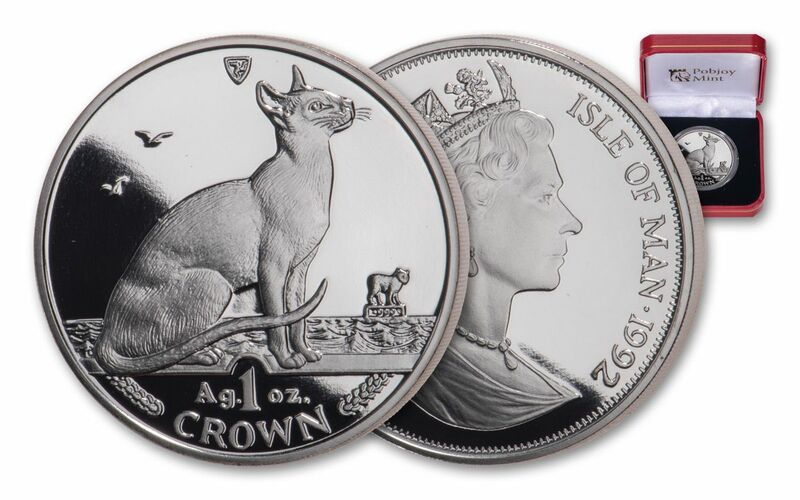 KEY FIFTH YEAR OF POPULAR SERIES – The 1992 Isle of Man Siamese Cat Silver Proof is the fifth release in the Pobjoy Mint’s popular cat series that ran from 1988-2016. The coin’s reverse depicts the mysterious good looks of the Siamese Cat in splendid detail. The coin’s obverse features a profile of a young Queen Elizabeth II. 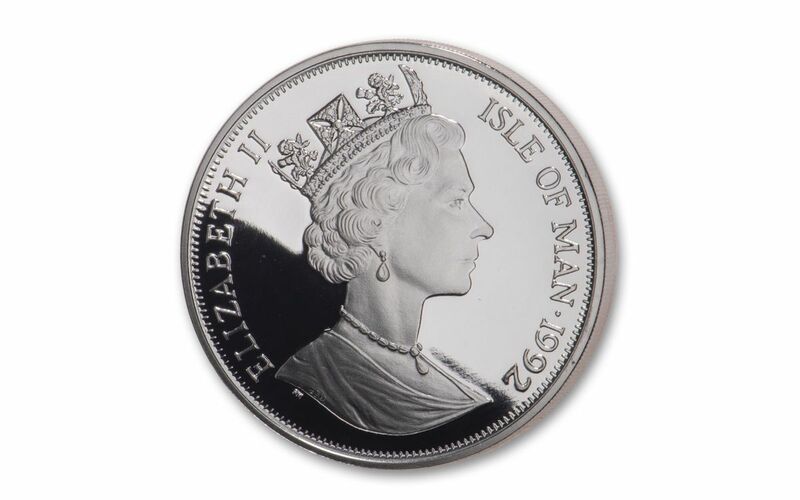 STRUCK IN HIGHLY-PURE SILVER – Each 1992 Isle of Man Siamese Cat Silver Proof is struck in one ounce of highly-pure 99.9% silver. GORGEOUS PROOF CONDITION – Your 1992 Isle of Man Siamese Cat One-Ounce Silver Proof was expertly crafted by the artisans at the Pobjoy Mint from hand-selected planchets, polished dies and multiple strikes to produce beautifully frosted details rising over mirror-like fields. 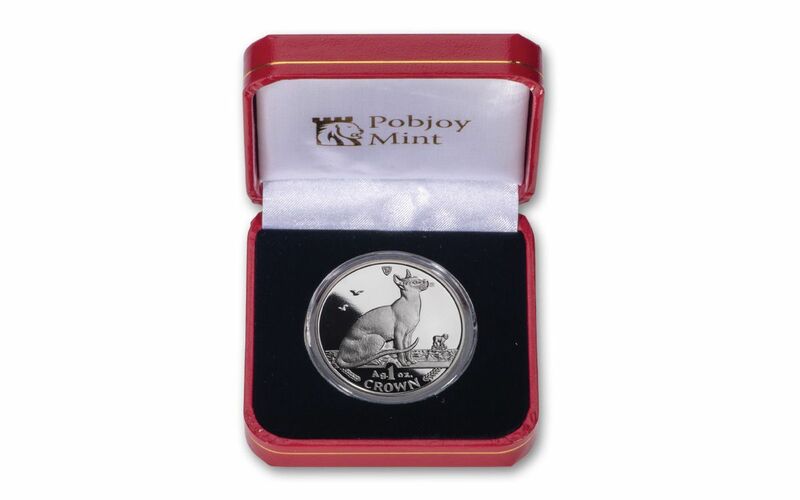 There are only a limited quantity of 1992 Siamese Cat coins left in the Pobjoy Mint’s vaults. Once they are gone, no more will be struck – ever. Don’t miss out, order yours now!